In a large bowl, beat the room temperature cream cheese and room temperature (neither melted at all) until completely smooth. Add the powdered sugar and dry brownie mix and beat until smooth. Stir in 1/2 cup miniature chocolate chips and the toffee bits. Wrap tightly in plastic wrap and place in the fridge to chill for 3-4 hours or until completely firm. Spread 1/2 cup miniature chocolate chips on a large plate. 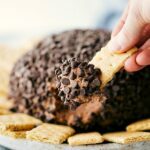 Unwrap the cheesecake ball and put on top of the chocolate chips. Use the remaining 1/2 cup chocolate chips to coat all the rest of the cheesecake ball. Serve with "dippers" of your choice.